As a tribute to those who served during the years 1914-1918 — on the Home Front or at Front Line — Commando has produced a series of stories of characters caught up in the tumult of the First World War. None of them are real people but we’d like to think that the experiences they have will not be a million miles from what actually happened to so many. In the previous issue, our heroes were from the ANZAC and the Royal Navy, battling away in Gallipoli. As that campaign ground on, new offensive started on the Western Front in France — The Battle Of Loos in the Artois and Champagne region. The Tommies might have had tin hats now but that was the only improvement to their lot, for even the British were now using the dreaded poison gas. The “Phantom Major”…the “Battling Major”…every man in that company had a different name for him, and when he led them every man would fight to his last drop of blood. 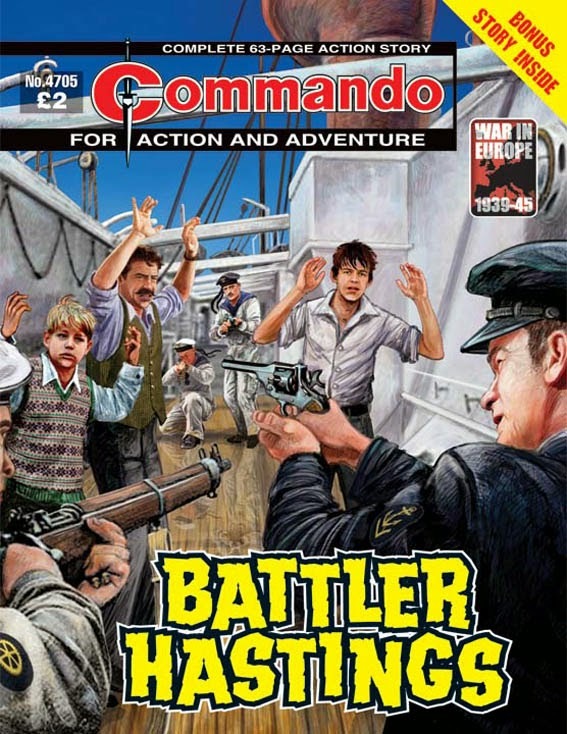 Here’s another slightly misleading Commando cover. Not that there’s anything wrong with Ken Barr’s mighty illustration it’s just that…well, this isn’t the air story you might expect. Ah, but what a story, Mr Skentleberry! Classic Commando fare — a man who pretends to be something he’s not (despite the consequences) plus action, action, action. And what superb action illustrations, too, the pen and brushes of Alonso were seldom so well employed. Check out those faces, too — masterful stuff. Oh, and be prepared for a little twist at the end. Augustus “Gus” Hastings was the strict-but-fair headmaster of St. Sebastian’s school — an institution that had educated those destined for high military rank or government appointment for generations. With the Second World War raging, Gus and his pupils were packed off to the safety of Newfoundland. En route, however, they were caught up in a hair-raising adventure, tangling with Germans all the way. As time went on, the boys realised there was more to Gus than met the eye. And just where did he learn to fight? This is the story of the Fairey Swordfish torpedo dive-bomber…an out-dated biplane at first glance, yet still a very powerful weapon in the arsenal of the Fleet Air Arm. For, unlike many other planes, they could take a lot of punishment and still fly. Their crews scoured the seas, their mission to seek out and sink enemy shipping — often with spectacular results! In Commando we always have fictional characters but, for authenticity, they can be placed in real-life military organisations. The Royal Navy’s Fleet Air Arm gives us double the usual amount of scope — for a yarn that can encompass both a sea tale AND an aircraft story, in this case the Fairey Swordfish torpedo bomber. Author Ian Clark does this skilfully and delivers a script that manages to be thoughtful and thrilling. It’s dynamically illustrated by Ibanez, whose rain-drenched, stormy scenes on pages 9, 10 and 11 are not for the faint-hearted! Thanks Ramon. I'd just published the press release as they sent it to me but I'll make the correction.